The use of violets dates back to at least the time of the Ancient Greeks. Pliny states that a garland of Violets worn about the head will dispel the fumes of wine and prevent headache and dizziness. The ancient Britons used the flowers as a cosmetic, and in a Celtic poem, a bath is prepared by infusing violet flowers in goats' milk to increase female beauty. In the eighteenth century, sugar was perfumed with violets to produce a sweet known as Violet Plate, then considered of excellent remedy for consumption and was sold by all apothecaries. The fresh flowers can also be used as an addition to salads. Prepare a green salad and then sprinkle the flowers over the top to produce an edible pot-pourri. 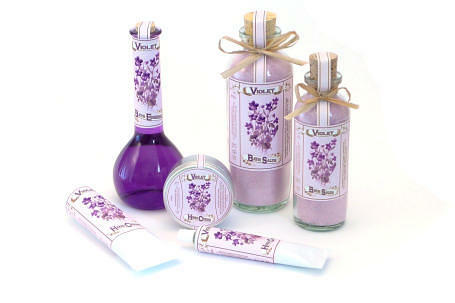 Click on the links below to find out more about our violet scented products.